Vice President George H.W. 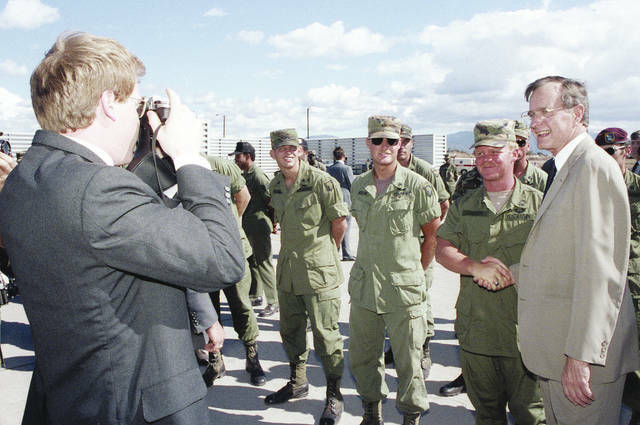 Bush is pictured at the Soto-Cano Airbase in Honduras, Jan. 26, 1986. Pictured at Bush’s right (in sunglasses) is West Liberty-area resident Joel Wilson, who was a U.S. Army sergeant at the time. Local resident Joel Wilson shared the following recollection of meeting then-U.S. Vice President George H.W. Bush during Wilson’s time in the U.S. Army in the 1980s. Wilson and his wife Debby live in the West Liberty area and he works at Honda Transmission nearby. Bush passed away Nov. 30 at the age of 94. Bush, who served as the 41st U.S. President from January 20, 1989 to January 20, 1993, was memorialized with ceremonies in Washington D.C. and Texas during the past week. “During my deployment to Honduras with the U.S. Army in the winter of 1985-86, then VP George H.W. Bush stopped at Soto Cano Airbase at Comayagua, Honduras en route to a meeting in Tegucigalpa, likely regarding the ongoing Contra-Sandinista situation. “VP Bush got off (his airplane) and made a brief address to the assembled troops, lined up on the tarmac. He only had time to go through one line of the many lines of troops, and fortunately for me, I was in this line. He made his way through the line shaking hands and such, and when he got to me he stopped, and noticing the aircrew wings on my jungle fatigues, he said ‘Sgt. Wilson, you know that I too was a military aviator …’ This started a brief discussion about our military aviation roles, as he was a decorated Navy pilot in World War II. He was very gracious, and I was able to share with him that we were a detachment of 6 CH-47D ‘Chinook’ helicopters deployed form Ft. Campbell, Kentucky, and we lived on the dirt road side of the airfield in a wooden hooch with no plumbing in a place called ‘Camp Blackjack.’ Years later, I thought of how I could possibly get a copy of the photo of me with VP Bush, as many photographers were taking public relations footage. I contacted his presidential library in College Station, Texas, and after a lot of research, I was able to find this one photo in their archives. It’s one of my favorite pictures. In the photo (middle), I’m next in line to greet VP Bush, that’s me in the sunglasses. Information provided by Joel Wilson.